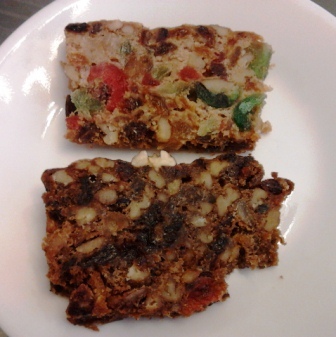 The more I taste fruitcakes from Georgia, the more I like them. As I had mentioned in a previous post, I bought a set of fruitcakes, the light and dark fruitcake, from Sunnyland Farms. Sunnyland Farm's main business is pecans, so although I was expecting the fruitcakes to have pecans in them, I wasn't expecting anything fabulous. But these are pretty darn good fruitcakes. I was sent the catalog after my order, something I usually don't like because a) I've already bought what I want, why have a catalog, and b) it's a waste of paper and postage. But I actually enjoyed the Sunnyland Farms one, and read it from cover to cover--at least the bottom of each page, which contained a running commentary of things about the company as well as descriptions of many of the workers there, which was really heartwarming. How nice to be featured in your company's catalog! Back to the fruitcakes. I bought the fruitcake combo, containing two 1 pound, 7 ounce loaves, one each of the dark and light fruitcake, both containing pecans. All of Sunnyland Farm's prices contain shipping, so I paid (and you would pay) $39.70 for the home box--unadorned fruitcakes. They also have a gold-foil gift box available for $43.20. Neither of the cakes contain booze, but there's enough flavor in each of them where I didn't really miss it. Yup, that's me, the "I love booze in fruitcakes" woman, saying that. I think the secret ingredient in both that added a bit more flavor was juice: orange juice in the light, grape juice in the dark. Let me break them down a bit. The dark fruitcake contains brown sugar and molasses, dates, dark raisins, your usual candied fruit trinity of cherries, pineapple, and citron, and a dash of lemon peel. Here's a cake where I actually didn't mind the raisins! They were well integrated into the cake, and they weren't terribly dry or overpowering in their raisiny-ness. Perhaps they're macerated in the grape juice? I'll see if I can find out. I think the juice definitely adds another element to the cake. The brown sugar and molasses gave this cake a truly dark flavor, and I always enjoy the extra complexity dates give to the mix. The thing that makes the flavor of this cake distinctive, however, are the spices: cinnamon and cloves. Cinnamon! I don't think I've seen cinnamon in a cake since the Harry & David one. Both fruitcakes share what I feel is a good balance between cake and fruit and nuts. There is enough space between the ingredients where you can taste the cake, and it has a nice, cake-like texture, not gooey. These were really nice cakes. Since my top Southern style cake, Mary of Puddin Hill, is really no longer available (see the update and comments here), I'm going to move it to the bottom of the list, then move Georgia/Womble's up and these right below. Georgia up, Texas down. Ordered these cakes today. Will let you know what I think! Maybe not gooey, but they sure are sticky! However, I have to say they taste better (both cakes, in different ways) every time I eat them. The dates really make the dark one. The dark one is a p.m. dessert, I'd say, while the light one is suitable at breakfast. Glad you like them, anonymous. I agree that they grow on you. Happy New Year from Mondo Fruitcake!